Dry shampoo is quite the versatile hair aid when you need to de-grease, boost volume and add fragrance to stale hair. We've ALL been there once in a while---oily, dirty, messy tresses. And NOT much time to primp. 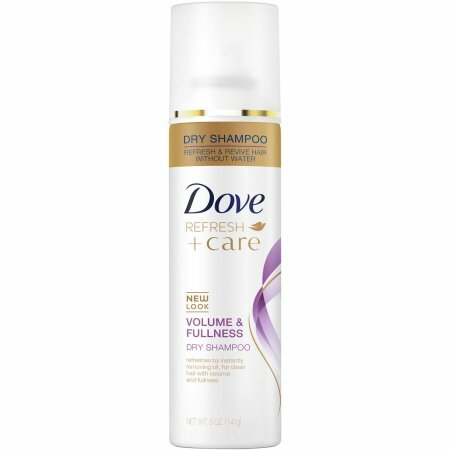 Dove Refresh + Care Volume and Fullness Dry Shampoo ($3.49), at RiteAid.com. You CAN'T beat that rock-bottom price! The scent isn't bad. Reminds us a bit like a fragrant dry-cleaner's scent, if that is even possible to imagine. This dry shampoo give LOTS of body + boost. Dry shampoos are great to have on hand and can help EXTEND the life of your blow-out. We have dark brown, almost black locks, and sometimes we notice the spray will leave behind a little white residue, but your hair dryer can make it disappear pronto. Some women have it, and some do not. And let's face it, we really are looking for casual comfort when traveling in the friendly skies. Project Runway's Heidi Klum is a veteran supermodel, and she understands about the perfect traveling ensemble. Here she is, Wednesday, arriving home in L.A., following a solo business trip. We LOVE Heidi's comfy ripped jeans, white tee, sneakers, large patterned tote bag and big gray duster. That kind of coat is warm + versatile and looks great dressed down or dressed up. The length is midi + ideal for fall/winter. Heidi's simple bun + classic aviators give the supermodel a polished, chic look. To COPY Heidi Klum's airport style, check out gorgeous dusters like this one--- from the UK's Boohoo.com. It's called the Kate Belted Shawl Collar Coat ($35). Use the PROMO CODE CYBER60 + get 60% off the COAT!